Washington, D.C., United States, January 7, 2016 /ChinaNewswire.com/ - In the wake of ongoing developments in North Korea and the South China Sea, four former Secretaries of Defense will discuss key security issues between the U.S. and China at a program hosted by the National Committee on U.S.-China Relations in Washington, D.C. on January 11. 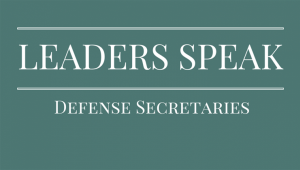 Defense Secretaries Chuck Hagel, William S. Cohen, William Perry (via live video) and Harold Brown will join a 90-minute conversation and Q&A with National Committee President Stephen Orlins before a 250-person audience to launch the Leaders Speak series. The Secretaries will address past security relations with China and discuss emerging issues in the relationship including North Korea, South China Sea, cross-strait/Taiwan relations, terrorism and the security ramifications of climate change. Six Leaders Speak programs on U.S.-China relations are planned for 2016, including former Secretaries of State, Treasury and Commerce, and National Security Advisors, as well as one for senior Chinese leaders (2017). DATE/TIME: Monday, January 11, 2016: 5:00-6:30 p.m.
PLACE: Omni Shoreham Hotel, 2500 Calvert Street NW, Washington, D.C. ACCOMMODATIONS: Camera Riser/ Mult Box provided. The National Committee on U.S.-China Relations is the leading nonprofit nonpartisan organization that encourages understanding of China and the United States among citizens of both countries.